Indian spiritual teacher Satya Sai Baba's legendary incense. An aromatic blend of resins, gums, spices, flowers and oils with a wonderful after-aroma, Nag Champa Indian incense is highly fragranced. 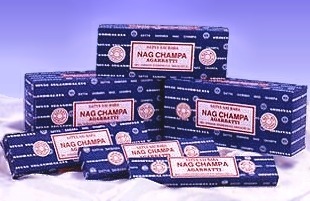 One of most popular incenses, Nag Champa is available in 15, 40, 100 & 250 gram sizes, (satya has discontinued all larger sizes as of mid 2010) Approx 1 gram = 1 stick. Whether you purchase the smallest, or the largest size, you will be sure to enjoy this wonderful scent both during meditation and relaxation. We have now added our "other" Nag Champa offerings on this page as well along with their larger sizes!